Here is the nerve center of operations . I didnt know i could get so much into a small space. All craftrooms need drawers, the more the better and mine are nearly floor to ceiling. The computer is a great asset to both comuncations, ordering, making cards and inspirations. I have silhouette which is wonderful for cutting words out and shapes that dies cannot be bought to do. I have a cuttle bug and a calibur. Use the cuttle bug the most as tight on space at the moment.. I have cutting pad in fornt of pc . The colour printer is a must . I just got a sewing machine so that will be creeping into my card making too. I have number of cutters, tonic guilotine plus paper/ card cuter that embosses, cuts wavey line, dotted line to detatch invites, and striaght cut. (very useful saves so much time). I have a hougie board as measuring is so precise on it. The crafters compion ultimate pro is wonderful for doing shaped cards(think its 27 different folds) and saves so much time. I have a ribbon rack so I can see what i have and what I need to order or get. 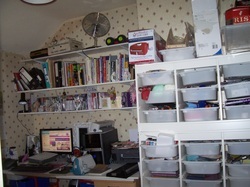 i think you will find your craft room will evolve with you and never stop growing for all those things you NEED .